Since growing hemp is now federally legal, it makes sense that people will want to grow it just like they now legally grow marijuana in some states. There is much to be said about the benefits of cannabidiol (CBD) and its potential for treating a host of physical and mental disorders. Even before hemp and hemp-derived CBD became federally legal, the state-level legal CBD industry was making tremendous strides and was clearly a viable market. One significant but often overlooked segment of the now-legal hemp industry is the creation of artisan hemp flower that truly conforms to the new legal definition of hemp: It contains 0.3 percent or less of tetrahydrocannabinol (THC) so the psychoactive effects are nonexistent. This flower—as well as products derived from it—are now federally legal. What hemp flower can provide to people who want to benefit from CBD is the benefit of whole-plant cannabinoids and terpenes rather than hemp extracts like oil. Whole-plant medicine harnesses the benefits of “the entourage effect” and all of the various compounds found in hemp flower in ways that oil cannot. The entourage effect is a phenomenon that occurs due to the interactive nature and synergy of all of the various cannabinoids, terpenes, amino aids and other compounds naturally found in the cannabis plant and its flowers, regardless of whether they are marijuana or hemp. Those who research the entourage effect believe that certain compounds promote the strengths of others in complex ways. This is a fairly new science that will the subject of increased research in the future. The creation of artisan hemp flower strains is now occurring at a rapid pace. Overnight, a new segment of legal cannabis flower production and creation became a lucrative endeavor. The boutique flower market is an emerging segment of the legal cannabis industry, and any veteran cannabis enthusiast can tell you that there is a very discriminating contingent of cannabis consumers who are truly connoisseurs of the cannabis’ terpene experience. Cannabis cultivation companies are actively working to create new strains to feed a demand for new and interesting marijuana flower choices. That same situation is now occurring with artisan hemp flower. The consumers of both categories of cannabis flower desire the best, and only organically grown flower will meet their discriminating criteria. As you might expect, the various names given to this hemp flower is every bit as creative as the names for marijuana flower. Hemp strain names include Cherry Wine, Elektra, Berry Blossom, The Wife, Lifter, and Suver Haze. Sound familiar? It should. Suver haze sounds similar to Silver Haze, a potent strain of marijuana. We can only hope that the buyers of Suver Haze are as satisfied as most who buy Silver Haze. Like marijuana strains, including Silver Haze, the seeds for these elite hemp strains are available for purchase and cultivation. Several hemp companies sell them. Now in grow rooms nationwide, elite hemp strains can grow alongside high-quality marijuana. Since hemp under the new definition (0.3 percent THC or less) is now completely legal, any cannabis consumer should be able to grow it without concern for legal repercussions, right? After all, it’s now legal under state law to grow marijuana in many states. The answer to this question is a tentative “yes,” with some caveats. Hemp and marijuana come from the same cannabis plant. A good hemp strain and a good sativa strain look virtually identical—especially to someone who isn’t well versed in marijuana and hemp. Since hemp is now legal, outdoor consumption of it should now be legal, too, because it’s not a controlled substance like liquor and marijuana. While this is correct, hemp flower contains the same terpenes and cannabinoids (except THC) as high-quality marijuana. The smell of hemp flower when smoked is virtually identical to marijuana, which may earn you a citation if law enforcement officials smell your product if you’re smoking it in public. The same holds true for growing it. If you’re growing marijuana at the legal number of plants allowed and add a couple dozen hemp plants to grow CBD-rich flower, you could be in trouble if law enforcement discovers your grow. The garden may be completely legal, but anyone viewing it will not know the THC content of the plants contained in it. Armed with that knowledge, a word to the wise about discretion should suffice. Avoid a legal infraction that can cost you money. If you want to grow high-quality hemp that provides a delicious terpene experience and high levels of CBD, seeds are now available for cultivation. 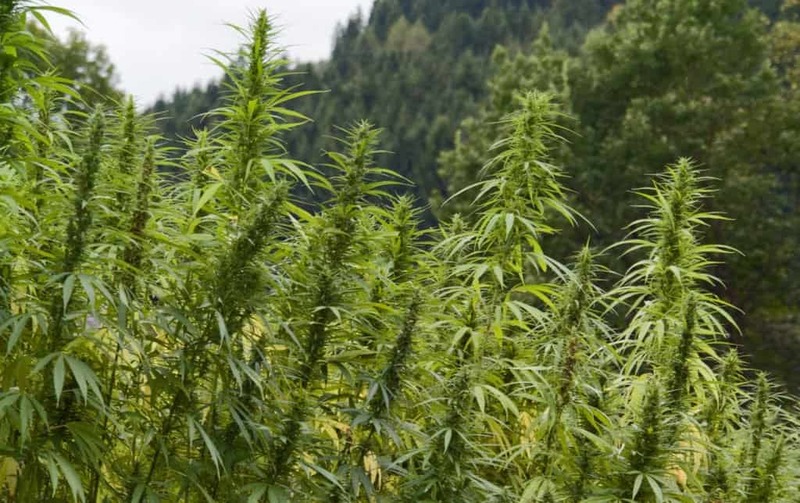 The general guidelines for growing this hemp are identical to high-quality marijuana. To grow a few large plants, you will want well-draining pots in the 5- to 10-gallon size range. You should fill these pts with a high-quality organic soil mix. Many of these come “pre-loaded” with organic nutrients like bat guano, earthworm castings, kelp meal, and other organic items. These pre-loaded soil mixes will work well for the first few weeks of growing your plants. Eventually, the nutrients that are present in the soil will be flushed from it through the process of watering the plants. At this stage, you will want to provide your plants with supplemental organic fertilizers. Often, good-quality fertilizers come in a variety of mixes for both vegetative and flowering stages of the cannabis lifecycle. If you purchased a mass-marketed organic soil mixture and liked the results, most likely the same company also sells a variety of soil additives you can purchase. Try to grow your hemp as organically as possible—or at least as organically as you can out of a bottle. If you have access to other truly organic additives like compost, by all means use it. Cannabis connoisseurs appreciate the sometimes-subtle flavors that can emerge from well grown and properly cured cannabis flower. The terpenes present in your hemp plants will rival some cannabis strains in the aroma and flavor departments. When it comes to harvest, evaluate the flowers in the same manner you would marijuana flower. For close evaluation, utilizing a photographer’s lupe is always a wise practice. You want to see mature calyxes and postils that are turning a bright red or orange color. The hemp flowers will have a sticky coating of trichomes that are similar to that of marijuana flowers, but instead of containing THC, of course, the beneficial cannabinoid contained in hemp flower is CBD. When the flowers are at the desired level of maturity, harvest them in the same manner as marijuana. Since hemp and marijuana flower are both cannabis flower, the drying and curing process for both is essentially the same. Hanging the flowers for approximately four to six days, followed by a long jar cure of several weeks will be the best way to capture the most flavorful terpenes and potent CBD level. Keeping the flower in Mason jars for long-term storage is the best practice, to retain moisture, flavor and potency. There is much to be said for growing CBD hemp flower. These flowers capture the whole-plant medicine and benefits of the entourage effect better than any other CBD-based product. Considering growing some if you want to delve into an entirely new cannabis experience.